Still feeling creative after the recent Scrolls Design Competition? We've got you covered: in this Flavor Text Design Contest, each Friday (starting today) we'll be presenting a scroll from the upcoming set 7. The problem? They're still missing their flavor texts! Take a look at the scroll in question for this week, Battle Dance! 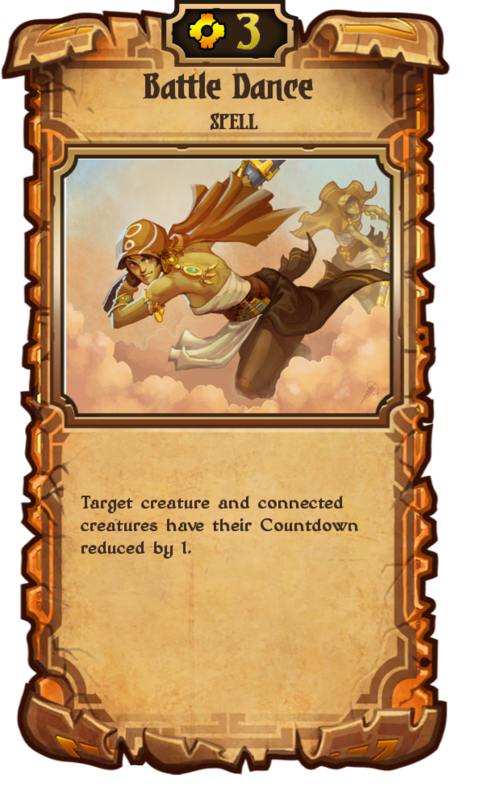 Now, here's what you have to do (you may have guessed it already): Design your own flavor text for this scroll. There are no guidelines you have to follow, just use your best imagination. If your text gets chosen, in addition to becoming that scroll's in game flavor text, you will receive a Tier 3 copy of that scroll (once the set it out) as well as the Design Contest avatar head. You must own a full Scrolls account (no demo users). Only one submission per player. You must provide your ingame name with your submission. The deadline for your submissions is one week from now. The winner will be announced at a later date. Now go grab your lorebooks and come up with something creative! See you next week, where we'll reveal the second scroll that needs some flavor! "It's a powerful beat. Puts a tingle in your fingers, and a tingle in your feet." Last edited by TheClockwork on February 20th, 2015, 19:14, edited 2 times in total. Think of one of the group dances at the Imperial Ball, except faster, and with a gaping cavity in your partner's chest. Now you're getting it. Last edited by GhostBomb on February 21st, 2015, 02:41, edited 1 time in total. Submission: If you want to impress the Canonetta, you better polish those moves. User name Apollysis "Electrifying or terrifying? Depends on what side you are on." Submission: Feet back, hip forward and punch! Last edited by 4Robato on February 20th, 2015, 18:51, edited 1 time in total. Dyrra dance moves are contagiously invigorating! Submission: The tribesmen of Dyrra have plenty of dances. Many of them are preformed to a rhapsody of cannon fire. Last edited by BlindBarghest on February 20th, 2015, 19:01, edited 1 time in total. "Most have seen this dance only once. It truly ends with a bang." ~Heavily injured knight. "Red rover, red rover, we're all coming over." Submission: "The sand makes the perfect stage."